Hot. Yes, but we still gotta eat…and I still gotta blog! I needed some tomatoes to make Stuffed Tomatoes. I have a few from the garden, but wanted to try the orange variety and grabbed 2 extras…just in case. I was also looking for some small-ish red potatoes to put onto skewers and grill with our burgers this weekend. (More on that next week.) I only grabbed eight, because that is all that would fit into one hand, pressed against my stomach. 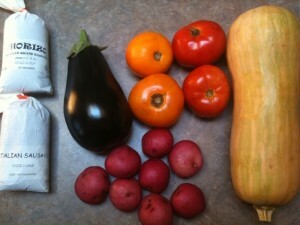 I was holding Tyler, and my market bag with the butternut squash and eggplant already weighing it down. I had little hand space and zero ability to balance. I pleaded for help from the boys, but they were only interested in the cookies and mini-pies on the table. So eight little red taters will have to do. The butternut squash…it was not at all on my radar, but as soon as I saw how gigantic it was, and how little it cost…the “great deal” signal on the radar started blipping. And beeping. Loudly. So I grabbed one. I’ll “process” it this weekend and let you know what I did with it next week! And the meats…as part of my baby steps towards more natural/grass fed/preservative/antibiotic/free-range/locavore eating. I decided to grab a pound of chorizo and a pound of Italian sausage. Have you stopped in at your local farmer’s market?!? Snag any amazing deals this week?!? Great price on the sausage! Local, pastured sausage at our farmers market is $6/lb. Going to the market tomorrow – always look forward to it! Awesome Allison…thanks for sharing!!! Looks amazing! Zucchini is plentiful around here. On Wednesday one vendor had medium to small sizes for $1/6. I think they had so many they just wanted to get rid of them! I also bought 6 cucumbers for $1 and made refrigerator pickles, yum! I’m glad I found your site today! I love eating on a budget and I always scour for great deals, so we’ll be good friends! I did stop by my farmers market and as long as I stay away from the honey and marmelades, and pestos and stick to the actual veggies, I stay on budget. I’ll be coming back to read more for sure! Hey Erin! With your lovely garden you have been doing the past couple of years have you ever considered growing your own potatoes? I am an Ohioan as well this was my first year planting potatoes and it is WONDERFUL!!! So easy, just stick them in the dirt and they grow like weeds! When ever they are on the menu the kids and I go and dig um up. They LOVE getting dirty and the flavor of potatoes straight out of the ground is delish!!! Yes…that’s on my garden plan for next year! We don’t have a local farmers market *pout* but I do go to one about 17 miles away – earlier this week I got heads of garlic for 25cents each, baggies of basil, oregano, and parsley for 75cents each, about 7 pounds of apples for $10, 2 nice-sized eggplants for $1 each, and saw other incredible prices – and it’s all organic!